Torta Pasqualina is a Ligurian torta. Pasqualina means “of Easter“, but the recipe calls for a dozen eggs! More spring-like than ever, and the pastry was a clear sign of spring, because eggs were seasonal not like today! The eggs production was therefore much lower, and in fact a hen could produce only 80 eggs per year, while today 300 plus eggs is the standard in modern hatcheries. So a sign of the time! The recipe of this torta can be traced back to the 1500s. Tradition indicates clearly that the puff pastry of the crust should be containing 33 tiny layers, to remind each year of Christ’s life. Modern recipes’ books generally quote only 8 to 6. The traditional recipe also indicates the cagliata or quagliata (prescinseua in Genova’s dialect), a soft cheese between yogurth and ricotta. Today we use ricotta instead. 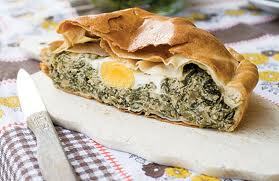 How to make Torta Pasqualina? Make a mound of the flour, pour in the oil and add 2 pinches of salt. Put in it enough warm water to work until you have a soft smooth dough. separate it into 33 small balls and let them rest, covered by a damp cloth. Wash the beet greens, cut away the hard ribs, slice them into thin strips, and blanch the leaves in lightly salted water. Drain all well and stir in 1 1/2 cups of the grated cheese and marjoram. In the meantime, put the ricotta or the cagliata on a sip to drain, or press it with a plate to remove the serum. When all has dried up, mix it into it with a bit of oil, flour and Parmigiano. Take 13 of the dough balls and roll them out paper thin. Grease a pie pan and lay down the 13 sheets, brushing all except for the last one. Spread the filling over the dough, drizzle it with a little oil, and then spread the cheese mixture. Crack 12 eggs into them,season them with salt and pepper and a tablespoon of unsalted butter. Take the remaining dough balls and roll them out, then lay them down over the pie, greasing them lightly top and bottom. Press the edges of the layers together and bake all for about 50 minutes. It’s good warm but much better when it has cooled. This entry was posted on Wednesday, March 14th, 2012 at 12:12 pm	and is filed under Italian Recipes and Food. You can follow any responses to this entry through the RSS 2.0 feed. You can leave a response, or trackback from your own site.